Paypal integrates seamlessly with Paypal PDT gateway. Setup paypal to receive one time or recurring payments. Auth.net fully integrated with autorize.net AIM and ARB system. Capture credit cards of your members and bill them according to payment plan. AlertPay most popular gateway after paypal, fully integrated. 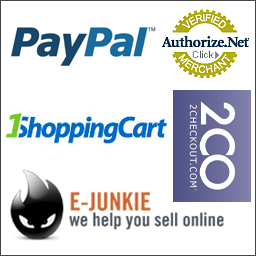 2CheckOut fully integrated, now your customers can pay through paypal using 2checkout too. More Gateways being added Constant Continuity is constantly being evolved based on user feedback and we are adding new features every few weeks. Up to 3 Upsells / Down-sell Offers allowing you to design your own upsell pages using easy WYSIWYG editor set your own price for upsell and define behaviors of upsells. Separate email message with every upsell which lets you specify an email message that will be sent to customers upon ordering a specific upsell. Very handy if you want to send out special download links to your upsell customers. Signup Form Customization allowing you to completely control the look and feel and behavior of your membership signup form. Add or remove fields as you may desire. Apply validations on required field. Setup up to 10 custom fields and show them as text fields, drop downs, lists or radio buttons. Up to 10 custom fields allowing you to specify additional fields in your signup form that are not part of default field set. For example, you may want to capture date of birth of your customers. Discount Coupons which lets you specify a coupon code and control its validity. Members who have a coupon code can apply them on member signup form. Manage Membership site Packages For each package created, you can create payment plans for weekly, monthly or annual payments. Specify your own price for each payment plan and define payment interval as you may desire. Recurring and 1 Time Payment Plan Lets you specify either onetime payment or recurring payment terms for your payment plans. Offer Free Trials Lets you create free trial offers on your membership site for desired interval of time. For example you can give away some content free for 30 days and after that you can start charging your members. Members can Upgrade / Downgrade their Membership lets your members upgrade or down grade their membership packages. Members can see their Billing History which lets them see how much they have paid and when will they be charged next. Cool Add To Cart Buttons allowing you to choose from a collection of cool add to cart buttons and put it on your signup form.